The other day I was teaching a class about the Restriction/Chaos Diet Cycle and I mentioned this cycle is fueled by obsession over weight. It’s true and if you wish to change food behaviors, weight cannot be the (or even a) focus. If it is, it can easily motivate you to manipulate food choices in a way that goes against self-trust, intuitive signals and body respect even without you being conscious of it. It inevitably feeds extreme, all-or-nothing, thoughts and behaviors. This class was being taught to a group that really wasn’t familiar with the principles of Health At Every Size. As such, these ideas were new to some in the group. I totally get it, especially because I was new to HAES at one time. It’s such a process to truly see weight for what it is – a really inadequate measurement of health and well-being. To be true to the lecture topic, I shifted focus back to strategic ways to decrease extremes and build more flexible and normal eating habits (I’m working on an on-line version of that, stay tuned!). It was clear that this wasn’t the time or the place to really do anything else justice and I wanted these class members to get what they came for. But gosh, this is such an important topic. 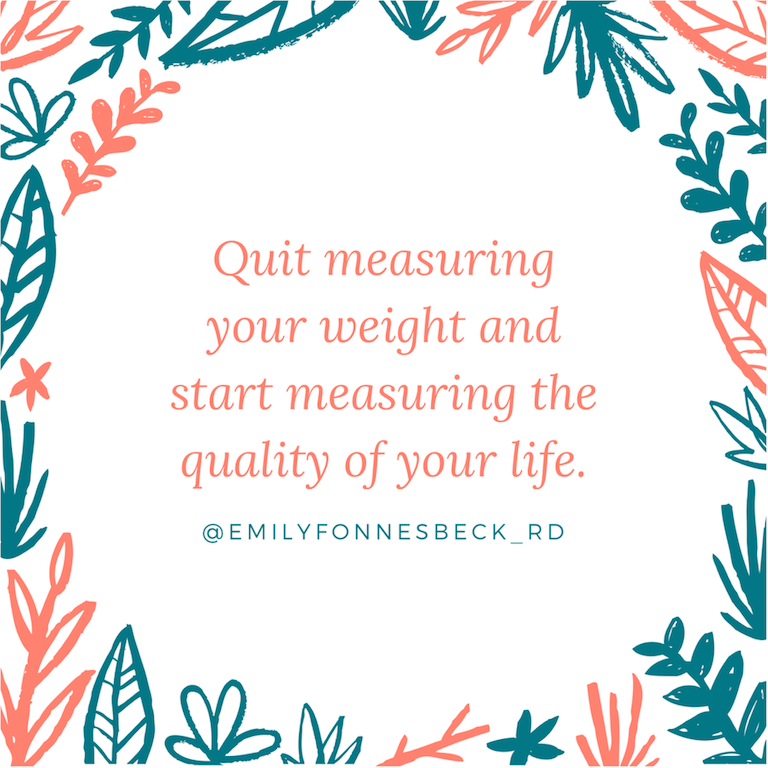 What I would have said to them if they were ready to hear it (and I really don’t think they were at all ready to hear it) is THIS: I would invite you to quit measuring your weight and start measuring the quality of your life. Here’s what I hear in response way too often when I say that: “that’s too subjective”. You guys!!! If measuring the quality of your life feels too subjective and scary and you feel like it’s just easier to weigh yourself, let me be the first to say that the issue is not a weight issue. It’s absolutely OK to say that your overall well-being matters more than preoccupation with the scale. When we aim to control our weight, our weight is actually controlling us. It dictates everything we eat, what social events we do or don’t attend, how we feel about ourselves, what risks we take, what jobs we apply for, what bathing suit we do or don’t wear, what memories we make (or don’t make if we don’t like how we look), what pictures we are in, how we respond to other people, our mood for the day, the choices we make, how effective and capable we feel…we could go on and on. It’s just so clear to me that focus on weight is distracting, preoccupying, emotionally distressing, disempowering and oppressive. It has the very real potential to negatively impact the quality of your life in exponential degrees. It is ESSENTIAL that you factor that in, even if it feels too subjective. Would changes in eating behaviors improve your quality of life? Possibly, but that can absolutely be done without building preoccupation or feeling overwhelming, and even with no emphasis on weight. It’s really about supporting yourself in ways that are truly effective, with food and otherwise. I did try during the lecture to introduce the idea of self-compassion. We think that a critical mindset is keeping us safe or motivating us to change but it’s actually only building shame and eroding self-trust and self-efficacy. Punishing yourself with restriction when your weight creeps up does nothing for your health and well-being. What will be helpful is practicing interoceptive awareness, or building awareness for the signals your body sends you to communicate it’s needs. This will include hunger and fullness levels, thirst, heart rate, respiration, need for elimination, urination, energy levels and stress. It’s a skill that is often missing in those with disordered eating, but something that you can practice and cultivate. Learning to listen to and respect these signals builds trust that you can meet your own needs without rules. Interoceptive awareness is suppressed when we are focused on outside measurements like calories, grams, points, weight or the like. If measuring quality of life or overall wellbeing feels subjective, that’s likely due to lack of experience with listening to and respecting natural, biological signals of self-moderation. If eating habits have been haphazard or chaotic (as occurs in the restriction/chaos diet cycle), those signals could feel unreliable. As you aim to establish more consistent, regular and adequate food patterns (which is only possible when we aren’t focused on weight), they will feel much more normal, rhythmic and reliable. Not weighing yourself and instead focusing on habits and behaviors that feel supportive will absolutely be a healthier and more effective approach. I hear clients repeatedly say that not knowing their weight but instead focusing on how they feel (that interoceptive awareness, connection and body respect!) has been the best thing they’ve done for their health. I totally maintain that focus on weight is keeping us from health. Isn’t it sad?! We are very disconnected and it’s difficult to realize to what extent for most people. But totally possible with some patience, guidance and direction. And so worth it, right!? This is so interesting. I’m currently in an ED recovery program that focuses on an intuitive eating, HAES, and feminist approach and it has been utterly life changing for me. I’m 40, having lived with various disordered eating and exercise behaviours for almost 25 years and have never sought help prior to this. The GP I’ve seen for close to 20 years didn’t know about my ED. What I find remarkable is that I fully trusted body to be able to birth my daughter. I worked with a midwife and trusted that my body knew what to do and when to do it, that it was biologically programmed with that knowledge. I realized that for the last 25 years I did not trust my body to know what to eat and how much to eat. I initially felt completely lost not being at either end of the restriction or binge cycle. It seemed absurd to be told to trust my body with food, I was sure it didn’t have a clue. And then it clicked. I trusted my body to birth, a biological function…. Children automatically self regulate and eat intuitively (until we interfere), another biological function. I could learn to trust my body with food. My GP has been supportive and is learning though my experience. I wish more doctors could bend their minds around this approach, because a lot of their "helpful suggestions", which I’m sure are well meaning, but misguidedly contribute to EDs. Thank you for sharing your story! I love your observations and am so happy to hear you are finding answers, help and peace. I agree wholeheartedly about better informed physicians (and health care professionals in general); they could prevent a lot of cases from progressing too far. Thanks again for sharing! Thanks so much for this! I decided to ditch the scale a few days ago and every time I read something like this, I am encouraged that I am doing the right thing by not worrying about my weight anymore.